Delorie online viewer enables you to view your site in a text browser. Information about the viewer by AK BK Home. Includes details of its current status, common questions, and object classes. EnSight post-processor for scientific/engineering data, EnVideo animation viewer, EnLiten 3D animation viewer. Support stereo and VR environments. Free tool for reviewing Earthcams list of online webcams. Enables the viewer to selectively filter out any gender and present the results in ascending or descending order by viewer count. Provides AV Picture Viewer - a picture viewer and graphic converter tool for use on Windows operating systems. Supports many image formats and multimedia files. A guide to fixing the Go.Netscape.Viewer downloading problem, designed for beginners. Windows software to view over 650 webcam images from around the world. Support for creating time lapse movies, thumbnail viewer, and option to refresh images which are dark. Viewer that supports all DXF/DWG, HPGL, HPGL/2, JPG, and TIF files, even within ZIP archives, and allows to print them. A vendor of Java applications including Sketsa SVG Graphics Editor and Ekspos Image Viewer, a freeware Java image viewer program. Collection of Windows programs and utilities for work with databases from Berezhnoy: Multi Database Viewer 5.0, Easy DBF Viewer, and UNIDAT. Versions for DOS/Windows/Linux. Free viewer for viewing and walking around models created with ViewBuild software. Image viewer offering windowed and fullscreen view modes. Skinned user interface lets to view, pan, zoom and rotate JPG, PNG, BMP and TGA images including images in compressed ZIP files. Documentation, downloads, FAQs, and support forum. Full channel RSS / XML viewer and bookmark server. A portable, cross-platform, sidebar application. Able to read all RSS versions. Products include a text file viewer, finder, and editor. Binary Browser for software companies, programmers and web developers. Periscope Image Browser a image browser, searcher and viewer. Anything3D Glide Menu (java applet can provide any website with a professional looking navigation system, create a text-only menu, or combine both text and images together), Anything3D Presentation Applet (new interactive tour for image which allows to view presentation over the internet without requiring the use of plug-ins which take forever to download), Anything3D Pano Viewer (an exciting new panoramic viewer which allows web surfers to view panoramas over the internet instantly). Acrobat viewer for RISC OS. If the business hours of IrfanView Graphic Viewer in may vary on holidays like Valentine’s Day, Washington’s Birthday, St. Patrick’s Day, Easter, Easter eve and Mother’s day. We display standard opening hours and price ranges in our profile site. We recommend to check out irfanview.com/ for further information. 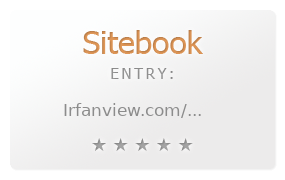 You can also search for Alternatives for irfanview.com/ on our Review Site Sitebook.org All trademarks are the property of their respective owners. If we should delete this entry, please send us a short E-Mail.